I just wondered if any Forum members recall the Umbrella Club in Coventry. It was situated in Queen Victoria Road and I used to go there in the early 70's. It was a handy place to go with your mates when you were around 15 years old and you couldn't quite gain access to pubs! It was an 'arty' sort of a place but occasionally a local band would play there on a Friday or Saturday night. From what I can remember it closed in Queen Victoria Road and the building was subsequently demolished. I seem to recall it relocating (somewhere around Greyfriars Green rings a bell) but I certainly couldn't swear to its whereabouts. I also can't remember if it was council funded or who was actually 'in charge'. Mind you, when you're 15 years old, you don't really care! I would be interested to hear if any other Forum members have any memories of the Umbrella Club as I certainly have happy memories of the place circa 1971/72. All you ever wanted to know about the Umbrella Club is on a site I created here Terry (Tic) Watson was indeed not only involved but the Vice chair - later chairman of the Umbrella right from its inception at Little Park street from c.1955 onwards. I think he was an English teacher at King Henry VIII and a poet and the editor of Umbrella magazine - a 50's lit mag that published the likes of Philip Larkin (an essay by him is on on the site - Not the Place's Fault). I (Trev Teasdel) along with Al Docker organised the Friday band nights c.1970/71 - they started about 10pm and went on to about 2am. Both Neol Davies and John Bradbury (later of Two Tone) were in bands that played there in early 70's and they are the site quoted. It began in Little Park St 1955 but moved to 18 Queen Victoria Road c.1960 (if anyone has a photo of it - please post it). It was demolished end of 1972 and drifted for a while until 1974 when it reopened at the Charterhouse. It's still going but now meeting at members' houses and a far cry from its early days. I continued the bands nights in 1974 at the Hobo Workshop (Holyhead Youth centre) and Golden Cross for a year or so after as they would not allow bands at the Charterhouse. View more on the website. The oddest thing is that, with all the wonderful photos of Coventry emerging on this and other sites, I've not found one of the top part of Queen Victoria Road before 1972 that shows the Umbrella Club ie 18, Queen Victoria Road - demolished at the end of 1972 for that huge modern building shown in this picture here (if the link works!). I would love to show a picture of the Umbrella Club on the Umbrella site (posted on earlier on this thread) but there are no pictures that have emerged showing even that part of Queen Victoria Road prior to the redevelopment in 1972. There should be some surely - anyone help? In the linked picture I've tried to show where the Umbrella was and and what it is now and how it roughly looked with a picture from the other side of the road. Don't know of the Umbrella Club or where it was in QVR but this picture is Queen Victoria Road 1965. This is the demolition of Croft Road with I believe a few of Queen Victoria Road houses in the background. If you mean the houses on the right Anne that's Starley Road although the back of one watchmaker's house in Queen Victoria Road is just visible left-of-centre. Thanks Anne and Dutchman. I think Dutchman is right about the above pic - Starley Road and it's opposite the arcade. The Umbrella was further up on the corner of Greyfriars Road and Queen Victoria Road - No 18. It's now that new building with who knows what in it! According to Google maps part of it is the British Chamber of commerce. The other picture looks good and it's good that pics of QVR exist (I was beginning to wonder!). I wonder if that was Queens Road at the top before the ring road was built. The Umbrella club building was a town house but with a bay window top and bottom, and at least in the late 60's was painted white (ish). Don't know if that helps. 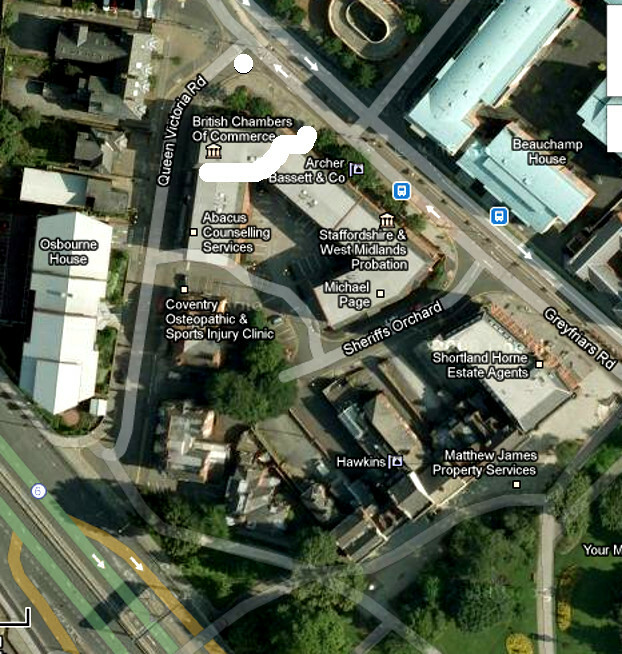 Here's the map - from Google maps - Umbrella was by the white dot I put on (British Chamber of Commerce). This any good to you Trev. Anne found this on a linked site on another thread and I remembered you. That one was on Little Park Street opposite Cow Lane. From International Times, Oct '69. I used to go to the Umbrella Club in the 70's - had my 18th birthday party there I remember - was a great place to hang out - lots of arty people and musicians - think they had a Folk Night which was always well attended. Brings back lots of memories. Think I remember your party Margaret, if it was this one, mentioned in the March 1971 Umbrella programme. Heather or Liz Lovatt as she called herself at that stage, ran the Folk poetry session. I did a few later on. The entry for March 1971 reads: - "19th Friday 9pm Maggie's Party - a party for members and their friends arranged by Maggie Heath. An inclusive ticket 20p + 5p non members, for drinks, food, live music, disco and dancing. A social occasion for everyone. Hope you'll all come." I've got the programmes on the Umbrella Club site in pdf form. Here is a link to the site if you haven't already seen it. Excellent stuff Trev - a mine of information as always! Have bookmarked the Umbrella blog as a favourite - looking forward to perusing at length tomorrow! Thank you Mr Green. Did quite a bit of updating of the Umbrella Club site.